I wrote in my notes: “This guy is brilliant”! In this instance he was talking to people, almost all of whom have a science background of some kind, but there is important and understandable take-away here for anyone willing to pay attention to what he has to say. Gary E. Machlis has recently been appointed the first-ever science adviser to a National Park Service director. We can hope that Director Jon Jarvis will be able to take his advice to heart. Machlis is also Professor of Environmental Sustainability at Clemson University, a South Carolina public university ranked highly among science and engineering schools. 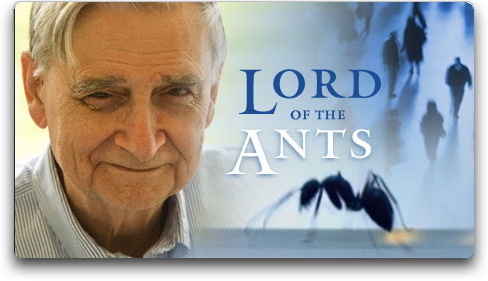 And he has written and co-authored numerous books about parks, biodiversity, and related topics. His most recent is Warfare Ecology, the historical effects of violence and warfare on places such as World War I Slovenia or many parts of Africa. Dr. Machlis provides a stellar example of how to organize a lecture of just over twenty minutes and yet plant important ideas that will take root in the minds of his audience. He begins with a mention of a 1942 book (C. C. Furnas, The Next Hundred Years), full of predictions such as that the technological limit for a wireless receiver will be a two-pound backpack. Go figure. Machlis’s own predictions for what is “just over the horizon” in technologies that will be useful to park managers include quantum biology that will help explain how birds migrate; new ocean research platforms like the newly launched USS Neil Armstrong, designed for ocean research; “CubeSats,” tiny satellites that can gather date wherever they are; and citizen science that he foresees will involve young people up to high levels of serious participation. Also totally new to me is the idea of “de-extinction”: cloning and re-creation of extinct species, which could involve major ethical decisions. And there was much more. Near the end of his talk, Machlis brought out the statistic that 87% of scientists believe that human evolution took place over time, while 32% of the general public believe this. 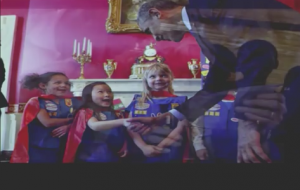 But he ended on a definitely upbeat note, showing a picture of the young girls who won awards a few days ago at the White House Science Fair. Screen shot of Science Fair winners and Barack Obama. Wolves are “just like us”! Comments Off on Wolves are “just like us”! Yellowstone’s wolves are always in the news. Back in late 2012 the Obama administration lifted federal protection for wolves in Wyoming. In the year following, trophy hunters killed 62 wolves. An unknown number were shot or trapped. Then, on September 13 of this year, federal judge Amy Berman Jackson returned Wyoming wolves to Endangered Species Act protection. Wyoming’s congressional delegation has now pledged to go to Congress in an effort to get wolves again delisted in the state. As the legislative ping-pong game continues, Doug Smith, Yellowstone wildlife biologist and leader of the Yellowstone Gray Wolf Restoration Project, has fascinating things to say in a 23-minute Iowa Public Radio interview about the history of wolf re-introduction in the park and the present state of wolves. Tempting you to listen to this excellent interview, I’ll mention a couple of highlights of Doug’s remarks. Although the next official count will take place in mid winter, current Yellowstone wolf numbers are at approximately 130 wolves in 11 packs. In discussing the ongoing argument about Canadian wolves being introduced, thus bringing in a different subspecies from those that historically lived in and around Wyoming, Doug explains that over the decades when no wolves lived there, no exchange of genes could take place due to geographic isolation. He states that there are now 5 subspecies in North America, not the many more claimed by some people. Doug points out that Yellowstone is now returning to “ecological functionality”—big words for the balance achieved in the environment by returning wolves to the park. He completely empathizes with the ranchers in the ring of land that circles the Greater Yellowstone public land, where wolves now live. Unavoidably, preying on their livestock is a big problem, but ideas to cope with this are multiplying. 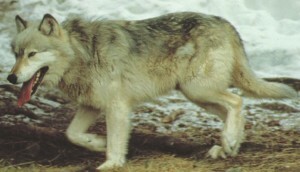 Replying to a listener’s question about attacks on humans, he stresses that wolves are afraid of humans and/or “can’t figure us out because we walk on two legs.” He suggests that the big, bad wolf stories may be based on some historical attacks but could well have been referring to rabid wolves. After a summer of legal battles over the fate of wolves near Yellowstone, a federal judge has recently ruled that a large number of wolves in Idaho and Montana may be legally killed by hunters. The slaughter has already begun; four wolves have been shot in Idaho and one in Montana. 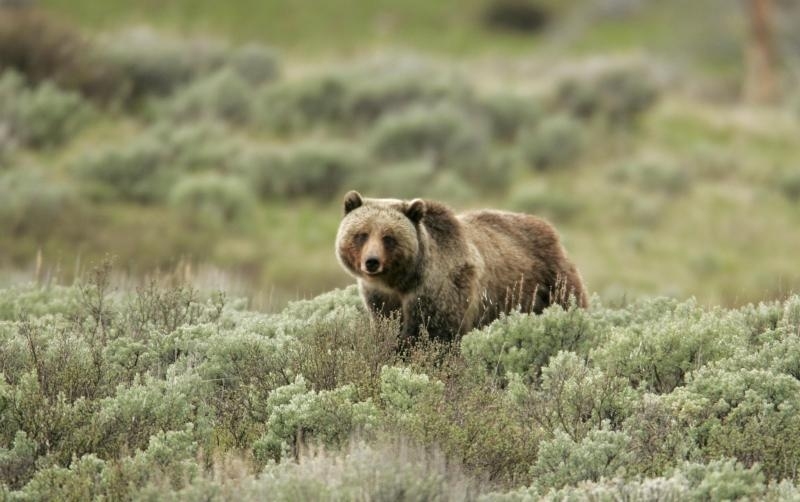 However, Defenders of Wildlife is hopeful that their legal challenge to the Interior Department’s delisting of wolves in Idaho and Montana will ultimately prevail. Among the comments, one reminds us of an important part of the judge’s decision: “This column completely leaves out the element of recovery that the Fish & Wildlife Service set out for wolves in 1994 and a federal judge ruled it had not met in 2008: ‘genetic exchange between subpopulations.’” As has been clear since reintroduction of wolves was first proposed, this is a complex issue, and much more effort and time will be required before all its aspects are resolved. 2. Snowmobiles are to be limited to 318 per day for the next two winter seasons, more than the daily average entering the park in the past two winters, but cutting by more than half the 720 authorized to enter by the previous decision. Meanwhile, 78 snowcoaches holding 10 or 12 people will be allowed to enter. 3. This year, 3300 bison are living in Y.N.P., according to a recent count. This is a reasonable number to sustain the herd. Now, if only the agencies which have been hazing and killing the animals in the winter will develop and implement a more reasonable policy! 4. 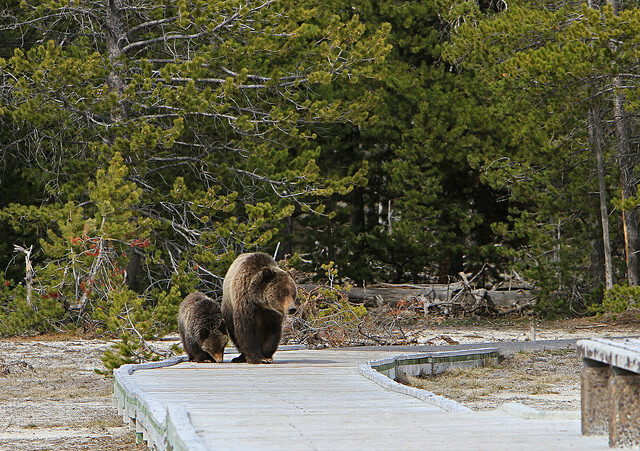 For the year, more than 2.6 million people have visited Yellowstone, making the first eight months of 2009 the busiest January through August in the park’s history (as reported in USA Today, 9/15/09). 5. Not news to anyone interested in Yellowstone but good news for all our national parks is the attention paid by Ken Burns and Dayton Duncan, who have produced twelve hours of what promises to be fascinating public TV watching in their series on the parks—including some footage of all 58 of them—beginning on Wednesday, September 27, nationwide.